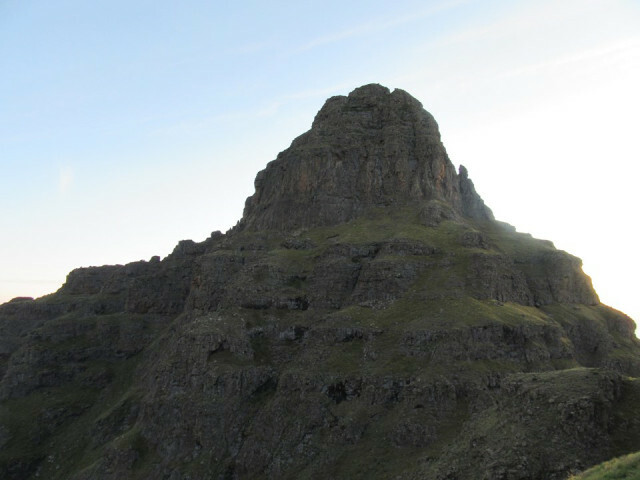 The Cathedral Peak Ridge is probably one of the most iconic ridges in the Drakensberg. With four different summits above 3000m, and a large collection of rock climbing routes – there is no shortage of activities to do on this ridge! I first summitted Cathedral Peak in 2014, and did the Outer and Inner Horn in 2017 – which left me with one of the climbing 3000m peaks: the Mitre. The highest peak on the ridge. While Cathedral Peak is climbed almost daily, and even though the Horns are rarely climbed, there is a lot of information online – finding detailed information on the route up Mitre is tricky. Luckily AndrewP provided me with lots of topo, and book Drakensberg Select had a route description. I had also eyed out the approach on a hike earlier in the year. So on Saturday morning, Ross and I set off from the hikers parking below Cathedral Peak Hotel to Twins Cave. Due to the lack of water on the Bell Traverse, we decided to use Mlambonja Pass. The Inner Horn as seen from below. Most of those chimneys have been climbed – we used one of the easier ones back in 2017. It was a very hot day, and our packs were heavy. We cooled off in the pool at the bottom of the pass before starting up the pass. The pass was very slow. It is not the hardest pass around, but when you add roughly 5kg to your pack for climbing gear, plus 1kg extra for the weight of the pack itself – that is a massive difference. We hit the final water around 350m vertically below Twins Cave. We knew there wouldn’t be water available for a long time, so we both drank as much as we could and then proceeded to collect 3 litres each from the river. We got to the cave just before sunset, and with some mist coming in. We agreed to an early start on Sunday morning, so at 4am my alarm went off. The trick to climbing Mitre is finding the correct gully, which proved easy enough. We walked a bit of the way up, took out our 20 litre packs, stashed the rest of our gear and proceeded up the gully with light packs. The gully was mostly straightforward. A few short scrambles, but no real exposure – so no problems there. The climbing route starts from the top of this gully. The climb starts by heading up on a ledge above a large drop. The rope felt like overkill, it wasn’t even proper scrambling – but the first step is onto a dodgy bit of grass above a large fall, so I guess a rope is necessary. I did this in trail shoes as most of this pitch was on grass, and climbing shoes have no grip on grass. Once you are through the first cliff band, you walk far to the left to find a very easy break in the cliff band. I got up this and belayed from a block that had been used for abseiling (based on the tat on it). Because the line had zig-zagged more than I expected, my gear should have been allocated differently to the two ropes to avoid rope drag. The next cliff band proved a bit more interesting, with a block that required a bit of effort to get up, so we roped it up. From the top of the 3rd cliff, you easily scramble through the fourth by going around to the right, and then proceed to traverse to the left around to the main summit. The final line isn’t obvious until you get far enough around the south side of the peak and find a loose rocky ramp up to the top. The final scramble feels a bit exposed, as the ridge is very narrow, but in reality it isn’t that bad. We stood on the summit just after 9am – so it had taken us roughly 4 hours to get up. Not express pace by any means – but we were up. By this point, our possible ascent of Ntonjelana Needle was off the table. After about 15 minutes on top, I reminded Ross that the summit is only halfway, and that most accidents happen on the way down – and then we began the descent. I always make a point of reminding myself and the people I am with about this when on top of a peak. You can’t get into the “I have done what I came here to do” mindset. The summit is optional, getting home safely isn’t. We reversed our line. We down-scrambled the top, and abseiled down the upper two cliffs. There was tat around two different blocks, but I decided that the block right above the gully would be best. We tested it by trying to move it, and it held up perfectly. We connected both ropes together, tied knots in the ends and Ross descended first. Before I descended, Ross tested the rope by pulling it 1m to see if it would pull through. This was the main reason for my selection of anchor – it was right by the edge, meaning that it would be easier to pull through from below. Nothing is worse than completing an abseil and having to prussik back up the rope to fix your anchor (well, there are worse possibilities, but let’s not go there). The downside of the anchor being right at the edge of the cliff (not the precarious rock seen in the photo below) is that the abseil becomes slightly more intimidating. But on the bright side, 50m range when the abseil is only about 30m meant that we could descend most of the narrow gully quickly by continuing to abseil down it. We made fairly good time down the gully. We reached our packs in the mist. We proceeded down the gully and found the Bell Traverse trail easily enough. Heavy packs back on, our progress was slow, and the mist meant that we didn’t get all the views – but at least we got the summit in good weather. The clouds briefly cleared at times to provide some ominous views of the spires above us. Ross didn’t even seem to notice the notoriously dodgy sections of the trail, walking across them as if they were nothing. Buggers Gully was in the best condition I have ever seen it in, which helped a lot. But, as always, it was still loose in places. We walked out via Organ Peel Gap, which was uneventful, aside from it starting to rain around Baker’s Chalet. We got back to the car around 5:15pm, slightly wet, but otherwise fine. Overall a great weekend out!